(CNN) Donald Trump’s list of illustrious golf partners just keeps getting bigger. Mere weeks after playing a round with Japanese Prime Minister Shinzo Abe, the US President is to take to the course in Jupiter, Florida, with Tiger Woods and world No. 1 Dustin Johnson. “Will be speaking to President Recep Tayyip Erdogan of Turkey this morning about bringing peace to the mess that I inherited in the Middle East,” tweeted Trump. “After Turkey call I will be heading over to Trump National Golf Club, Jupiter, to play golf (quickly) with Tiger Woods and Dustin Johnson. Trump has already played golf with Woods, Japan’s Hideki Matsuyama, Northern Irishman Rory McIlroy and women’s world No. 3 Lexi Thompson during his time at the White House. The 71-year-old lavished praise on Matsuyama, who branded it “an honor” to be given the opportunity to take to the course with the US President. During the trip, Trump took time to praise the skill of South Korea’s female golfers. To applause in Seoul, Trump acknowledged that “Korean golfers are some of the best on Earth,” before referencing their success at the 2017 US Open. 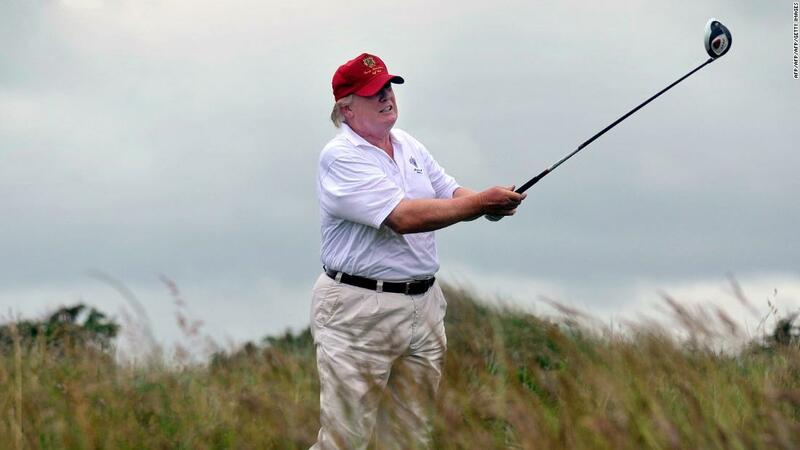 “The women’s US Open was held this year at Trump National Golf Club in Bedminster, New Jersey, and it just happened to be won by a great Korean golfer, Park Sung-hyun, and eight of the top 10 players were from Korea,” Trump said. READ: What’s it like playing golf with the US President? CNN Living Golf host Shane O’Donoghue spent time with the future US President back in 2014 at Trump’s golf course in Scotland. According to O’Donoghue, Trump “doesn’t possess the prettiest swing,” but is “deadly accurate” from the tee.